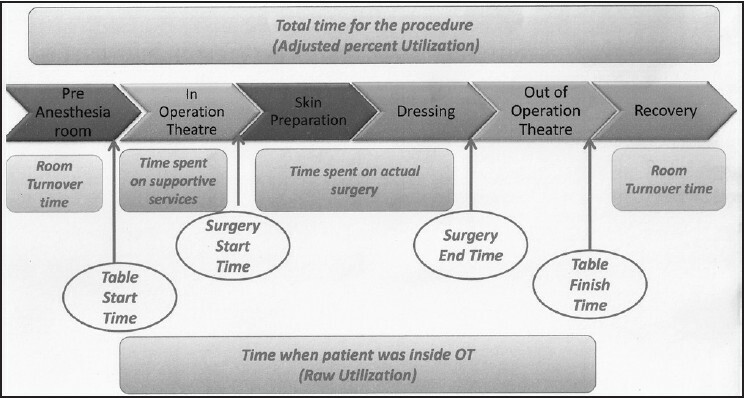 Context: Operation theater (OT) utilization. Aims: To analyze the time utilization and to assess the stated causes of cancellations of scheduled cases in the OT complex of a tertiary care teaching institute. Settings and Design: This prospective study was carried out from December 2010 to April 2011. Materials and Methods: each of the 16 OT tables was observed for 6 days (total 96 days). The available resource hours were taken as 0800-1600 hrs. (480 min/day; 46,080 min in 96 days). The following parameters were recorded - time spent on supportive services, time spent on actual surgery, room turn over time, time spent for total procedure and time between entry and exit of patient. Statistical Analysis: Data were analyzed using the SPSS software version 15. Results: Of the total 325 scheduled cases, 252 were operated and 73 (22.5%) were cancelled. There were delays on 15 days (15.63%) in starting the OT table at the scheduled time. Of the total resource hours (46,080 min), the mean "Raw utilization" was 37,573 min (81.54%) and the "Adjusted utilization" was 39,668 min (86.09%). The mean time spent on "supportive services" was 5539 min (12.02%) and on "actual surgery"' was 28,277 min (61.37%), and the "room turn over time" was 2095 min (5.39%). Among the stated reasons for cancellations, lack of operating time - 57 cases (78.1%) - was the most common. Conclusion: Study of time utilization and cancellation are important tools in assessing the optimal utilization of available resource hours in an OT. Background: The emergence of antimalarial drug resistance malaria parasite is widespread in North eastern region of India. During January 2012-December 2013, we conducted active surveillance for detection of antifolate resistance-associated genetic polymorphisms in Plasmodium falciparum malaria parasite from different malaria endemic areas of Assam. Materials and Methods: A total of 281 field samples were collected from suspected malaria patients of which 106 malaria P. falciparum positive cases were detected in microscopic slide examination. 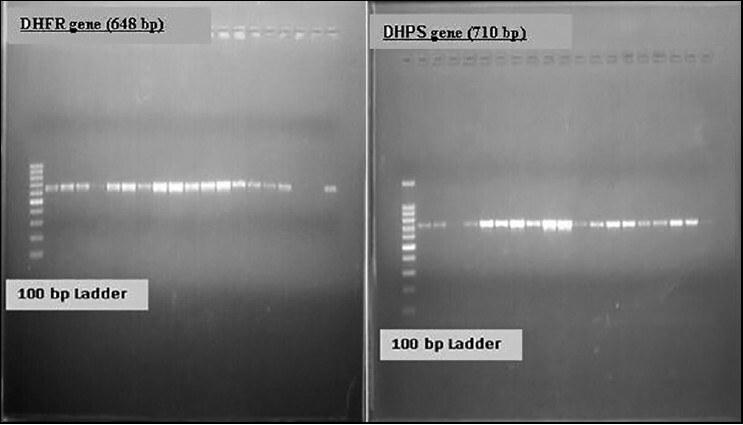 A nested PCR was done for amplification of a 648 bp portion of the dhfr gene and 710 bp portion of the dhps gene. Results: Mutation analysis revealed existence of three different haplotypes of the P. falciparum dhfr gene of which ANRNI was highly prevalent (90%). Triple mutant haplotypes AIRNI (N51I + C59R + S108N) of the dhfr gene associated with pyrimethamine resistance were prevalent in Chirang district of Assam. Whereas, dhps mutation study revealed that triple mutant haplotype AGEAA (S436A + A437G + K540E) associated with Sulphadoxine resistance was found among 26% of P. falciparum field isolates. However, P. falciparum dhfr-dhps two locus mutation analysis showed that there were a total of nine dhfr-dhps genotypes. Conclusion: It was noticed that 93.62% (88/94) isolates had mutations in the sequences of both enzymes, which is an indication of prevalence of high grade of Sulphadoxine - pyrimethamine resistance in P. falciparum malaria parasites in Assam. Background: Proliferation and differentiation of cancer cells are regulated by various cell cycle promoting and inhibiting factors. Our knowledge about these proteins and mechanisms regulating cell cycle progression has increased dramatically in recent years. 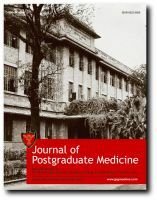 Aim: The present study was undertaken to examine the expression profile of cell cycle regulatory proteins in normal proliferative endometrium, hyperplasias (simple, complex and atypical) and endometrial carcinoma in a quantitative approach as also to assess correlations of Cyclin D1 expression with Ki-67 a proliferation marker. Settings and Design: A retrospective case control study in a tertiary referral centre. 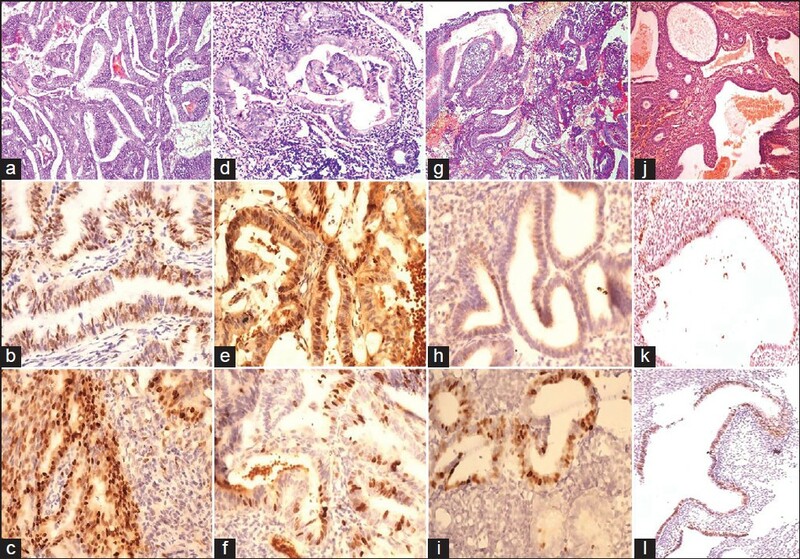 Materials and Methods: We evaluated and compared the expression profile of Cyclin D1 and Ki-67 expressions in 61 endometrial samples submitted as either endometrial curetting or hysterectomy specimens, which were diagnosed as simple hyperplasia (n =11), complex hyperplasia (n = 13), atypical hyperplasia (n = 7), and endometrial carcinoma (n = 20). Results: There was increased expression of Cyclin D1 and Ki-67 in patients with endometrial carcinoma relative to proliferative endometrium and simple hyperplasia, but there was no such difference between cases of atypical hyperplasia and endometrial carcinoma. Cyclin D1 expression had a positive correlation with Ki-67 expression. Cyclin D1 together with Ki-67 may be a marker for endometrial carcinogenesis and tumor cell proliferation. 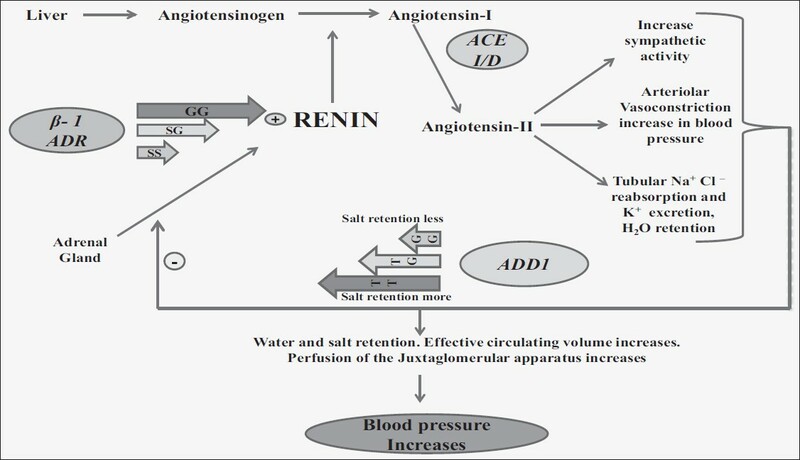 Background: The renin-angiotensin system (RAS) is an important facet of blood pressure regulation physiology. Treatment of essential hypertension targets the RAS using Angiotensin Converting Enzyme Inhibitors (ACEIs). However, ACEIs are not uniformly effective and show inter-individual pharmacodynamic variations. Aim: To assess the correlation between genetic polymorphisms in the genes coding for RAS components (angiotensin converting enzyme (ACE I/D), α-adducin (ADD1) and β1 -adrenoreceptor (β1-ADR)) and response to Ramipril. Materials and Methods: We recruited 120 patients with essential hypertension who were administered Ramipril monotherapy initially, followed by combination therapy, if needed, based on their responses. Relationship between genotypes of the three candidate genes and decrease in the blood pressure (BP) was analyzed. Results: One hundred and six patients were evaluable at the end of the study period and 21 different genotypes were observed among them. Seven of them were classified as responders after 8 weeks and at the end of 12 weeks, an additional 77 (72.64%) were deemed responders. 19/22 non-responders were treated with combination therapy and 7/19 (36.84%) showed a response to the same. There was a significant difference between the proportions of responders and non-responders among the genotypes of the ADD1 and β1-ADR genes (P = 0.005 and 0.003, respectively). The best predictors of response to Ramipril 5 mg daily were the II/GG/SS, II/TG/SS, II/GG/SG, ID/GG/SS, ID/GG/SG and ID/TT/SS and DD/GG/SS; II/GG/GG, II/TT/SG, ID/TG/SG, ID/TT/SG, DD/GG/SG and DD/GG/GG were moderately predictive and II/TT/SS, II/TG/GG, ID/TG/GG, DD/TG/SG and DD/TG/GG were poorly predictive of response. Discussion: Variable responses to Ramipril may be the result of genetic factors. Conclusion: Pre-prescription genotyping may help individualize treatment. Background: Opioids have synergistic action with local anesthetics which may alter characteristics of epidural block. Giving opioids to mother before delivery of baby is still fully not accepted with some fearing risk of neonatal depression. Aims: Our primary aim was to evaluate the analgesic effect of addition of 50 μg fentanyl to epidural 0.5% bupivacaine in patients undergoing elective caesarean section using visual analog scale. 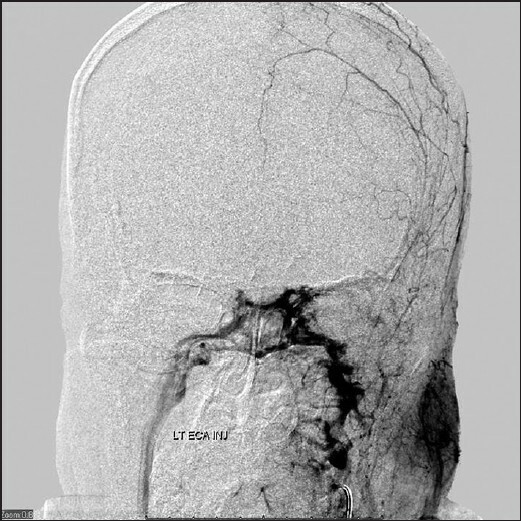 The secondary aim was to assess onset of analgesia, volume of drug required to achieve T6 level, grade and duration of motor block and Apgar score. Materials and Methods: In this prospective, randomized, double blind, placebo controlled study 64 patients scheduled for elective caesarean section under epidural anesthesia were randomly divided into two groups of 32 each. The fentanyl group received 1ml of 50 μg fentanyl and the saline group received 1ml of normal saline mixed with 10ml of 0.5% bupivacaine for epidural anesthesia. VAS score, time to achieve T6 level, dose of bupivacaine, intraoperative analgesic consumption and duration of analgesia, grade and duration of motor block and any adverse maternal and neonatal effects were noted. Statistical Analysis: Data was analyzed using Students t test, chi-square test and Mann-Whitney U-test. The values of P < 0.05 were considered statistically significant. Results: Fentanyl improved the VAS score significantly (1.6 ± 1.32) compared to the saline group (3.77 ± 1.0, P < 0.0001). 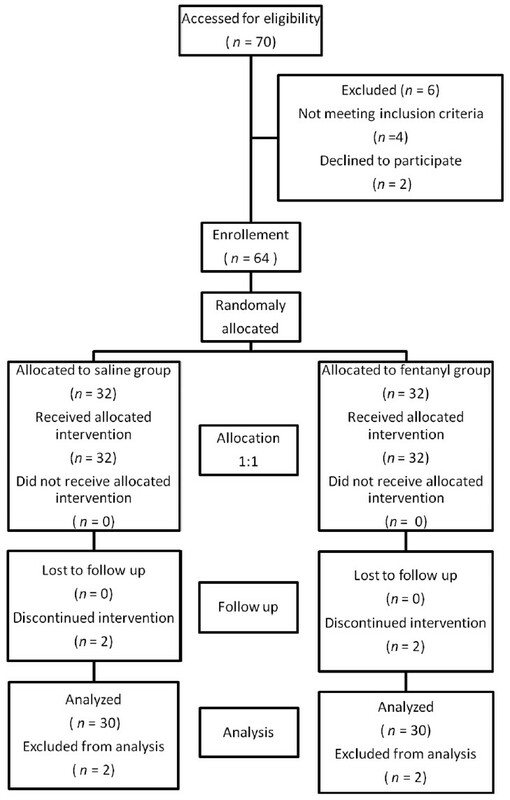 It also reduced the intraoperaitve analgesic supplementation compared to the saline group. (P = 0.031). The postoperative duration of analgesia was prolonged in the fentanyl group (275.80 ± 13.61 min) compared to the saline group (191.47 ± 12.16 min, P < 0.0001). The other characteristics of epidural block were unaltered. Conclusion: Addition of 50 μg fentanyl to epidural 0.5% bupivacaine significantly reduces the VAS score. It also reduces intra-operative analgesia supplementation and prolongs the duration of postoperative analgesia without altering the other characteristics of block. The neonatal outcome is not affected with addition of fentanyl before delivery of baby. Background: Meningiomas are uncommon neoplasms in the pediatric age group and differ in various aspects from their adult counterparts. They account for 0.4-4.6% of all primary brain tumors. Aims: To retrospectively analyze the clinicopathological and immunohistochemical features of pediatric meningiomas. Materials and Methods: Meningiomas in patients under 18 years of age diagnosed between January 2001 to December 2011 were analyzed retrospectively. 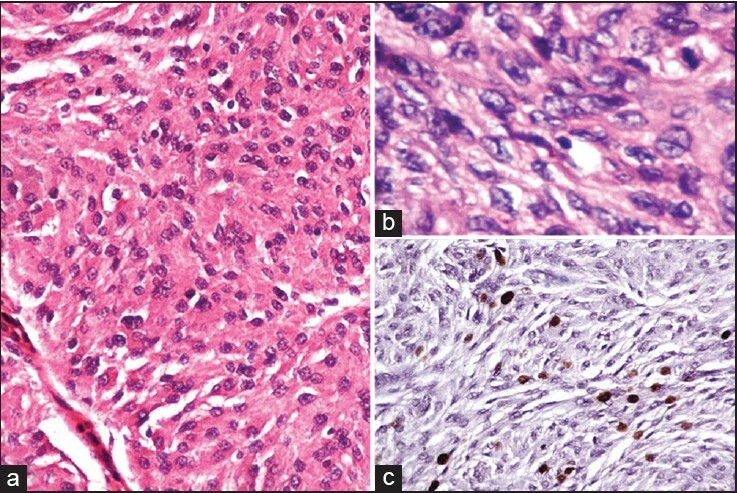 The hematoxylin and eosin stained sections and Ki 67 labelling index (LI) were reviewed for all the cases Results: The pediatric meningiomas accounted for 1.52% of total meningiomas (15/983). The mean age at presentation was 12 years with male to female ratio of 1.5:1. The presenting symptoms were headache, seizures, and motor deficits. 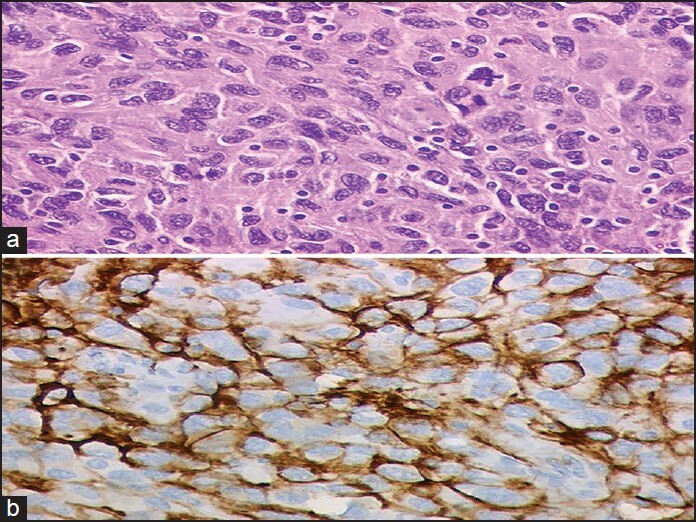 The histology included 9 cases (60%) of atypical meningioma (WHO grade II) followed by 4 cases (26.67%) of WHO grade-I and 2 cases (13.33%) of anaplastic meningioma (WHO grade III). Five cases had a recurrence. Ki67 LI ranged from 0.5% to 1.5% in grade I, 0.5% to 15% in grade II and 13% to 24% in grade III meningiomas. Conclusion: Meningiomas are rare in children and show a male preponderance. There was a higher incidence of atypical and anaplastic meningiomas in pediatric population. 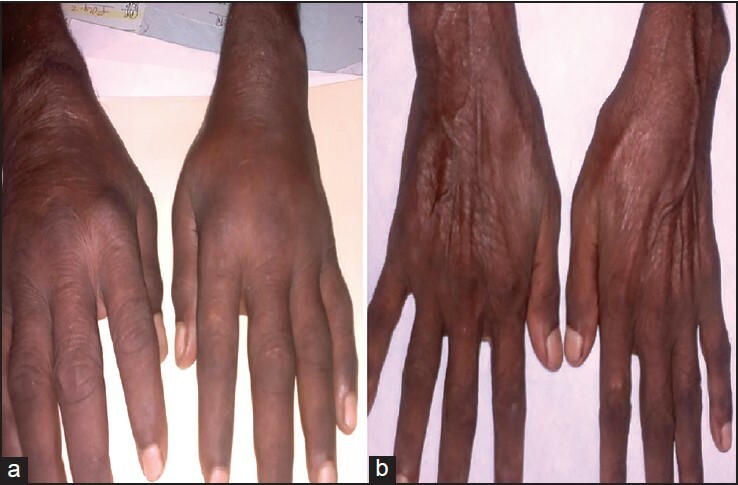 Remitting Seronegative Symmetrical Synovitis with Pitting Edema (RS3PE) is a rare clinical entity that is easily missed due to lack of knowledge. It was formerly considered as a subset of rheumatoid arthritis (RA), but is now regarded as a distinct disease/syndrome. 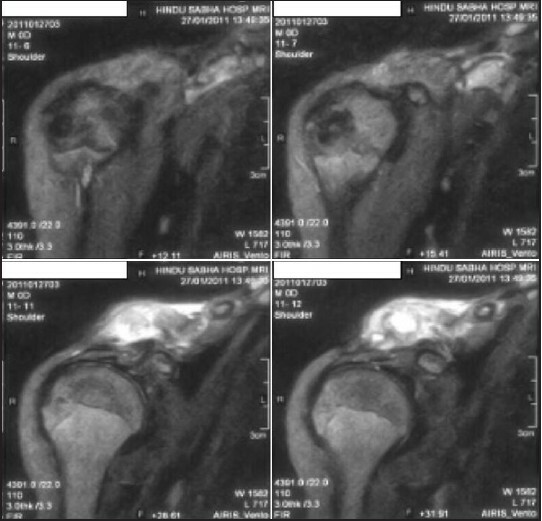 The diagnosis of RS3PE is not easy, as it is always hindered by the lack of definite diagnostic criteria and presence of other much common rheumatological disorders that mimic it. We report a series of seven cases that attended our clinic in the last year, which highlight the salient features of the disease. The disease was found to have a heterogeneous presentation. Immunogenetic, clinical, laboratory, radiological, and possible etiological factors and associations with the neoplasm are described, as also other peculiar presentations. Finally, a comparison with other common rheumatological disorders is made to alert the clinician about this rare, but easily treatable disease. Pyoderma gangrenosum (PG) is an uncommon inflammatory ulcerative skin disease. It is characterized by painful progressive necrosis of the wound margins. Rarely, postoperative pyoderma gangrenosum (PPG) manifests as a severe disturbance of wound healing following surgical interventions. Only rare cases of this complication have been reported after appendectomy. 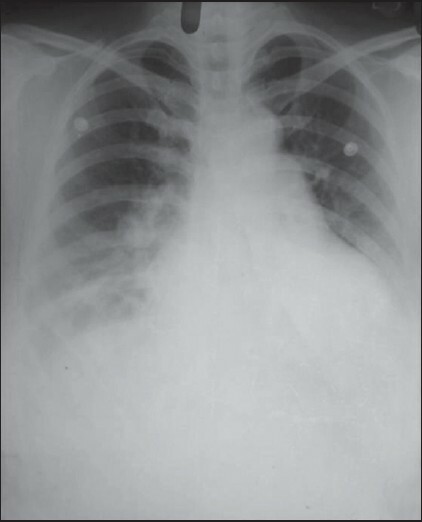 We report a case of PPG in a 29-year-old female after appendectomy. She was successfully treated with oral prednisolone. 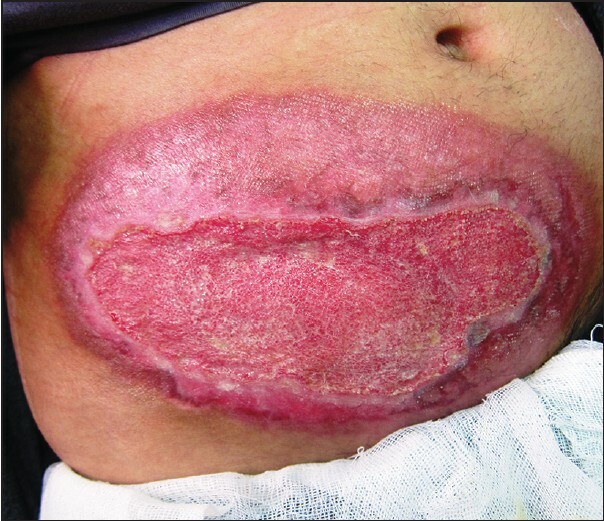 Postoperative pyoderma gangrenosum should be kept in mind in the differential diagnosis of any postoperative delayed wound healing, because this disease is simply distinguished from a postoperative wound. This is the report of an EBV + Leishmanial co-infection. The patient developed hemophagocytic syndrome (HLH) and was treated with the standard HLH-2004 protocol. However, PCR in bone marrow discovered this secondary cause for HLH. In endemic countries, visceral leishmaniasis should be considered in the differential diagnosis even in EBV-related HLH, as chemotherapy toxicity may be avoided. Hyperimmunoglobulin M (HIGM) type 3 due to CD40 deficiency is a very rare syndrome. Only 16 cases have been reported thus far. The clinical presentation is very variable. We present the first case of this rare disorder from India. The case is of a two-and-a-half-year-old female, with a history of repeated episodes of skin infections and diarrhea since birth. Laboratory evaluation revealed elevated absolute lymphocyte count and an absolute neutrophil count (ANC) of 1026/mm 3 . 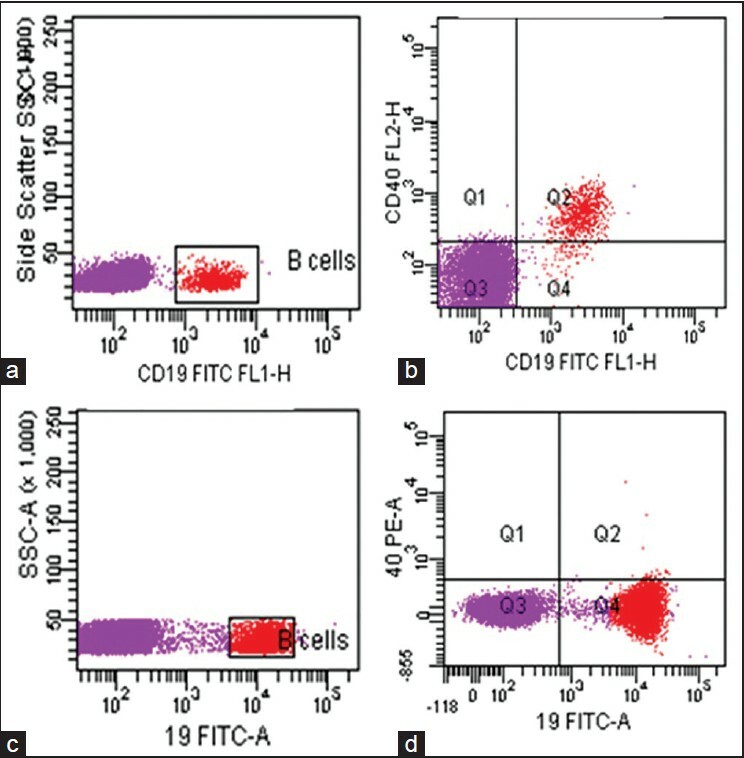 The lymphocyte subset analysis showed normal absolute counts of Natural Killer (NK) cells and elevated absolute counts of T-cells (CD4 and CD8) and B-cells. The serum immunoglobulin estimation showed low levels of IgG, IgA, IgE and an elevated level of IgM. The CD154 analysis was normal and expression of CD40 was absent on the B-cells. Molecular analysis showed a novel mutation, with deletion of 3bp (AAG) [p.Glu107GlyfsX84] in the homozygous state, in the CD40 gene. 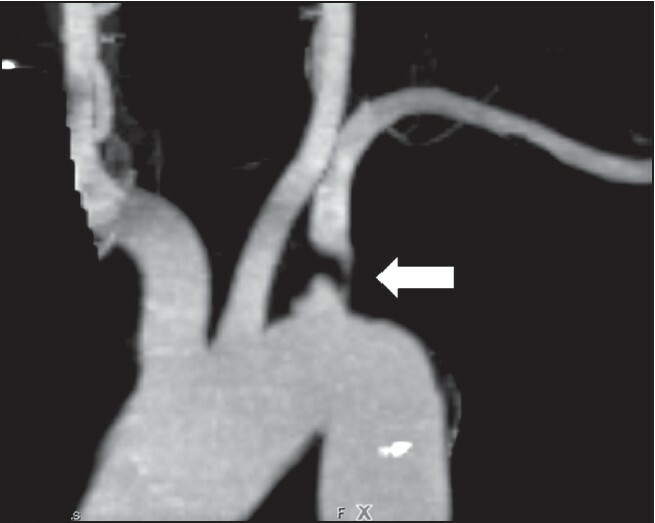 Thus the patient was diagnosed as HIGM type 3. The parents were screened and counseled regarding prenatal diagnosis at the time of next pregnancy.